Please note: this is a repost of a Indonesian press report. 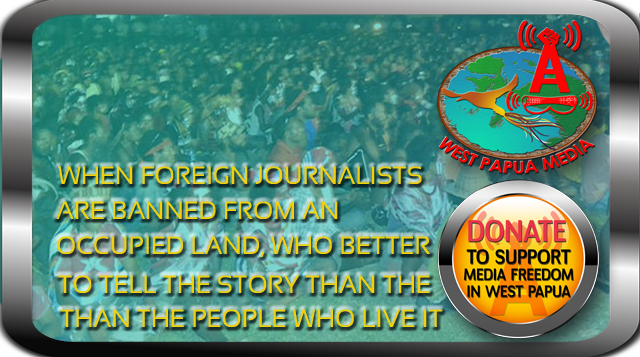 West Papua Media Alerts makes no assertion as to its accuracy. The separatist Free Papua Movement, which has been engaged in a low-profile armed resistance against the Indonesian presence in the province since the 1960s, on Thursday threatened to step up attacks against the government until Papuan independence was granted. “We, the people of Papua, remain steadfast in our initial stand to safeguard the dignity of the Papuan nation by gaining independence,” Anton Tabuni, secretary general of the group, known as the OPM, said in a video released to journalists in Papua. “The people of Papua will continue to struggle to secede from the Unitary State of the Republic of Indonesia,” continued Tabuni, who claimed to be speaking on behalf of OPM commander Goliat Tabuni . The video was released a day after armed men believed to be from the OPM ambushed and burned a convoy of three trucks carrying diesel oil and food in Pagargom, in the Tingginambut area of Puncak Jaya district. “Whether civilians, plainclothes or uniformed security members, we will rid Papua of them,” Tabuni said. The video also showed an OPM gathering in Tingginambut, believed to be a congress held by the organization on June 31. The meeting ended in a renewed resolve to fight for independence. Adrianna Elizabeth, a researcher of conflict areas at the Indonesian Institute of Sciences (LIPI), said the government should not dismiss the threat, even though the OPM was not a heavily armed organization. “Even if the social and economic conditions of Papuans improve, the OPM will always be there because it wants its political demands to be met,” Adrianna said, adding that OPM’s vast network had spread throughout urban and rural areas in the territory. “Human rights are not being upheld in the province and we should also realize that the Papuan autonomy law has not been well implemented,” she said, citing possible reasons for the persistence of separatist aspirations in the province . In a report released in March, the global think tank International Crisis Group warned that some elements of OPM were becoming increasingly militant. It also said OPM and the National Committee for West Papua (KNPB) — a group with its roots in the student movement — were likely behind the deadly attacks last year on workers near a mine run by a unit of Freeport McMoran Copper and Gold. The ICG recommended broadening talks between Jakarta and Papuan leaders to address political, historical and economic grievances. Meanwhile, police in pursuit of the perpetrators of Wednesday’s attack in Pagargom are concentrating on Tingginambut, known to be home to OPM’s central headquarters. “Since [Thursday] morning, our officers have been hunting them, especially in the Tingginambut area,” Wahyono said, adding that a thick fog and the mountainous, thickly forested terrain were hindering the operation. Wahyono said there were no plans yet to send reinforcements since the force already in Puncak Jaya was considered to be adequate. Papua Police have already deployed about 100 members of the elite Mobile Brigade (Brimob) to Tingginambut .